Europe’s version of a ‘space taxi’ is prepared for 100-minute test flight at hypersonic speed on February 11. The vehicle has been developed over five years at a cost of €150 million ($225 million). The shuttle-like spacecraft is called IXV (Intermediate eXperimental Vehicle), is re-usable, and could land on an ordinary runway someday. 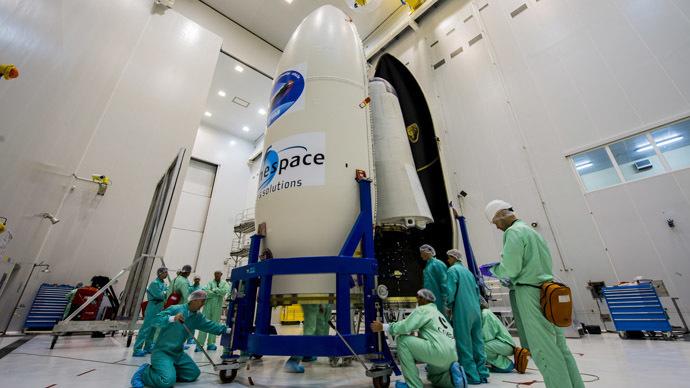 The launch will take place from Kourou, French Guiana, and the vehicle will be carried to the orbit by a Vega rocket. For the time being the main aim is to collect information on the vehicle’s handling and thermodynamics with the help of 300 sensors. Should the test flight be successful, it would provide Europe with the technology for a sample return trip to Mars, or a way to return astronauts from a space station: currently, the only way to bring the space travelers home is Russia’s Soyuz. “Launch preparations have resumed,” Jose-Maria Gallego Sanz, Esa's IXV launch campaign manager, has told Daily Mail. The space taxi is the size of a car, and weighs almost 2 tons. It will reach an altitude of around 412 km, allowing it to reach a speed of 7.5 km/s. IXV will travel through the atmosphere at hypersonic speed, then test re-entry technology, with parachutes deployed afterwards, slowing the descent for a safe landing in the Pacific Ocean. The Nos Aries recovery ship is now being tested in Panama’s Flamenco Island Anchorage.